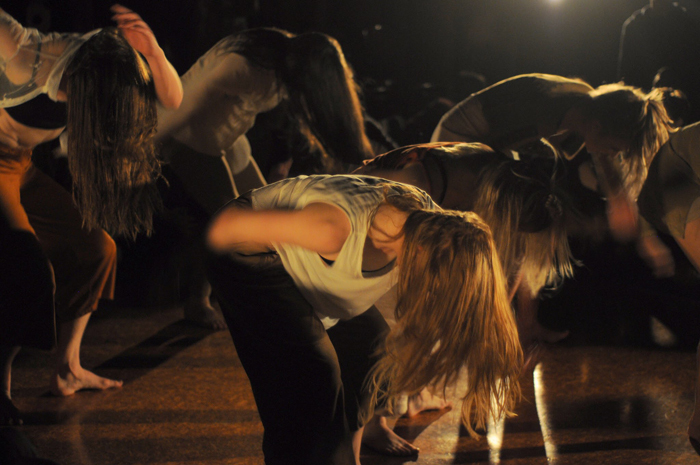 Dance Plant Collective is a contemporary dance theatre collective based in Auckland. Here Co-founders Tui Hofmann, Brittany Kohler, Natasha Kohler, Rosie Tapsell, Jaz Yahel and Bella Wilson discuss their approach to collaboration. Initially, we formed our collective simply to continue to work together after graduating from Unitec's Contemporary Dance course in 2016. Since then, we have created three full length dance shows – Desire Line(s) (2017), The Cost of Arms and Legs (2018), and MEAT (2018). We have collaborated on a diverse range of projects including dance films, performances in art galleries, music gigs and festivals, and taught a series of movement classes and workshops for both professional dancers and the wider community. Our vision is to create politically challenging and transformative performance work grounded in an ecological framework. Every project we embark on comes from a place of genuine curiosity and is often a response to the world we live in, and our place in it. Our collaborative practice is inspired by the genius of rhizome ecosystems; think mushrooms, ginger, and underground tree-root networks. We embrace both absurdity and authenticity, trusting the spontaneous cross-fertilisation of viewpoints to produce startling new material staged in equally surprising spaces. We aim to make work of our time; work that is political, or simply explorative which comments on situations we find ourselves in. However, every work we do is different, which is the blessing of working with six people, and is not bound by a certain style. We make work we are currently interested in, and this constantly shifts over time. Every creative process we step into as a collective shares one important commonality: a trust in the strength of collaboration. We believe in rhizomatic thinking – that great ideas happen collectively, by bouncing ideas off each other, stress-testing things, not holding onto ideas that aren’t working, and allowing whatever emerges to be given value and space. Everyone’s creative input is valued; however compromise is also important, as we are constantly negotiating our divergent interests, experiences and desires. We feel that the eventual result of working collaboratively leads to highly nuanced performances which are more accessible to a wider audience, and reflective of the world we live in. One of the special things about working as a collective is that we are constantly refining how we work together. WORKING WITH YOUR BEST FRIENDS ALLOWS FOR A NURTURING ENVIRONMENT WHERE WE CAN HELP EACH OTHER GROW AS PEOPLE AND AS ARTISTS. THIS GIVES US A HUGE LEVEL OF TRUST AND COMFORT WITH EACH OTHER, ALLOWING A SAFE SPACE IN WHICH WE CAN BE VULNERABLE AND TAKE RISKS. However, it can sometimes be challenging to separate ‘work time’ from ‘friend time’, and we find it super important to set aside time to catch up and debrief outside of rehearsals. Our roles within the collective are fluid, and shift between projects. In our first development of Desire Line(s), noone was in charge and it was difficult at times to make decisions. Since then, we’ve chosen to have more clearly defined roles within each project, so we can work more efficiently together and best utilise our individual skills. We still don’t have a person in charge when it comes to application writing, admin and social media tasks – we share the load and all chip in when we can. However, this year we have been hugely fortunate to have Zoë Nicholson come onboard as our producer for MEAT, which has made the world of difference! We’ve been able to stay in the ‘creative zone’ without having to constantly switch to logistics mode – which can be jarring and restrictive as a creative. Having someone so reliable, organised and creative with their producing has made our show promotion much more consistent and successful. Some of our biggest challenges are things that many emerging artists struggle with: finding time to rehearse our mostly unfunded or unpaid dance projects while simultaneously juggling our everchanging work schedules, and finding affordable and dance-appropriate rehearsal spaces. We all work multiple jobs, and have squeezed rehearsals into any spare gaps of time we have in order to keep things going. We were highly fortunate to have been granted a residency at Studio One Toi Tū last year, which offered us free use of their beautiful spaces for 10 months. These kinds of opportunities are quite rare; so outside of this, we’ve rehearsed in dance and fitness studios we’ve worked at, empty offices, and our living rooms! Quite miraculously, we just make it work. It helps that we are all very committed to our collective and passionate about the work we make. While we are faced with many challenges as emerging artists, working in a collective can provide a space to create, grow and develop your craft as artists together in a supportive environment. It has given us ongoing momentum and motivation to work on a huge range of projects, and has also enabled us to give back to the community through our performances and classes. We love working in this way and hope to continue to expand on what we do to provide more opportunities for other artists to connect with us. Original generation time 0.2617 seconds. Original generation time 1.1567 seconds. Cache Loaded in: 0.0004 seconds.